Remember back when I spun so much during the Tour De Fleece? My goal was to spin down all the various colored braids and bumps in my stash. I did a great job of spinning all that fiber back in July but then the bobbins just sort of sat around, waiting to be plied. 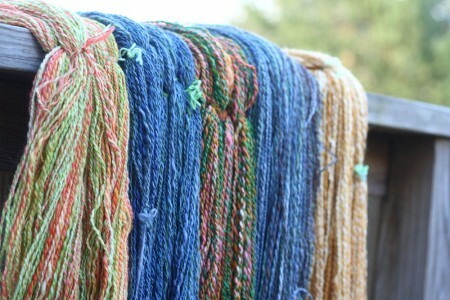 I’m happy to say that I finally finished all that plying and I have several new skeins of handspun. I have no idea what I’ll do with the yarn now that it’s finished but hey! I made yarn!! Very pretty skeins. I love how you cropped the bottom and top with text in between. 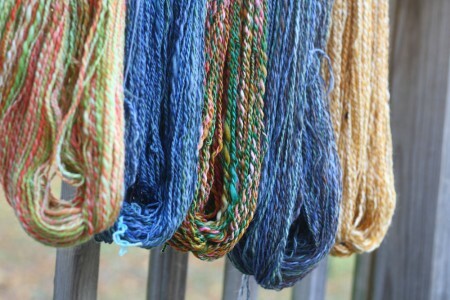 Or perhaps they are 2 separate photos- anyhow at first glance one thinks you are looking at full length skeins. Sometimes the making is enough. Just lovely, and what a great photo! It’s beautiful. How many yards did you get? They’d look great together as a Gaia Shawl. You did a lot of spinning! Cool layout of those two shots! The yarn is awesome. Like Margene, I was thinking of a shawl. Happy Wednesday! Beautiful picture, beautiful yarn. Doesn’t get any better than that! It’s gorgeous yarn! I hope you knit something beautiful from it. Excellent yarn but AMAZING picture presentation. I hope you find worthy projects for all your skeins! I join the chorus of people who say the photo cropping is awesome! Ooooh, nice yarn!! I’m sure the perfect project will present itself. Handspun yarn counts as a FO by itself! So pretty!!! Oooh, and it all looks so pretty together! Very pretty yarns. I love the way they look in the pictures and the way to out the text between the picures. Very creative. Ok, so I’m perfectly ok with admitting that most of what you said was total Greek to me! But I’m willing to learn, and the yarn is gorgeous! Love the text in the midst of the photo, very clever!! Colorful hats and mittens…after all, winter gets pretty cold in your parts! Great job creating so much lovely yarn. How about donate a skein as a prize to NaKniMitMo 2010? I’m sure Ruth will second this. They’d make lovely mittens! That amazing and the seem to be all color coordinated! Very purdy yarn ya got there! Love the yarn and the way you presented it. Well done. Yay! It is beautiful, and so wonderful that you get to revisit the fun of July again now with finishing the new yarn, and then later with the knitting. Beautiful! I am sure that you will find something nice to make with it. I got my first wheel in October and haven’t gotten to the point of having any hadspun yet…still learning and I had too much travel time over the last 3 weeks…but I will and I can’t wait. I hope mine comes out anywhere near that pretty.